Graceful gold plaits twist into an eternal knot. 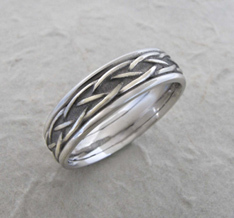 Crafted in careful detail of sparkling 14k white gold with white gold rims. Limited sizes available; made in Ireland. I love this ring, but the antiquing is not as displayed in the picture. It is beautiful regardless, and the service from GaelSong was excellent.